Ladies and gentlemen, if you want to lose weight, forgive from your heart—you will feel one hundred pounds lighter! Your heart that is enlarged because it’s filled with hatred and revenge will instead be filled with love and graciousness for others. Wow, that’s really taking the weight off. 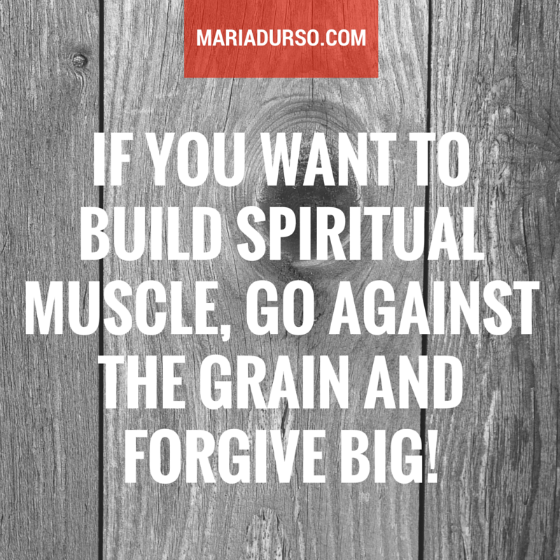 Also, if you want to build spiritual muscle, go against the grain and forgive big! This is the real test of our spiritual maturity and character development. Muscle building doesn’t just “happen”; you have to pick up weights that stress the muscle out. Dealing with the “weighty matters” of the heart is what grows us up and causes us to become mature giants in the faith. Is it time for your heart to be washed? Would you say, “Lord, give me a brain wash in my heart”? I hope so. You are just eighteen inches from growing up into a person the Lord wants to put in the big leagues! Let me say a prayer for you. I want to be all that You have called me to be, and I certainly don’t want my anointing to be infected with the disease of offense-itis. I don’t want to live in the land of offense, but I want to live in the land of the living. I want my feet to climb to higher heights as my heart is set free to soar. So I release the weights that have held my heart down one by one. Free Your servant, Lord. Let it be done unto me according to Thy Word, and may Your kingdom come down and explode in my heart on earth as it is in heaven. I recently started reading your blogs and they have been both encouraging and correcting. Thank you for your words and sharing your heart.